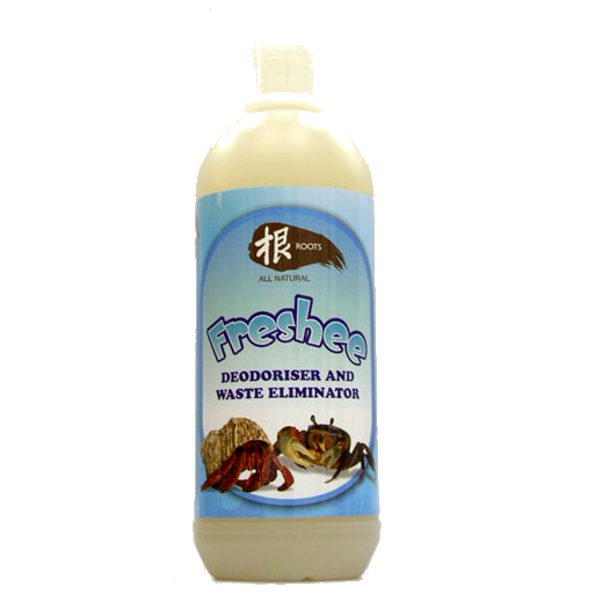 Roots’ Freshee Deodoriser and Waste Eliminator is a ready to use, stabilised, bacterial spore liquid concentrate, designed to biologically digest and deodorise organic waste. It’s biological active formula contains a proprietary stabilization system that will break down organix waste naturally and effectively. Proprietary bacterial cultures are selected from optimum extracellular enzymes production, assuring efficient breakdown of proteins, carbohydrates, cellulose and fats. The unique, non-engineered cultures rapidly digest odour-causing organic wastes. Odours aren’t just covered up, they are eliminated at the source. The Ballicus strains in these products have the ability to utilise ammonia as a nitrogen source. By reducing ammonia in the aquarium you have healthier fish and crabs. We use the Bacillus strains rather than Nitrobacteria because the Bacillus strains are much more stable than Nitrobacter. Nitrobacter can also lead to increased Nitrate levels in the tank. In addition to being more stable, the Bacillus strains also produce enzymes that degrade the organic waste which collects in the tank. By reducing the waste (food, faeces, urine) the tank is cleaner while the fish and crabs will be healthier. You can also see a reduction in algae levels in the tank.